We’d love your help. Let us know what’s wrong with this preview of Compassionate Conservatism by Marvin Olasky. To ask other readers questions about Compassionate Conservatism, please sign up. I like the theory of compassionate conservatism. It resonates deeply with my belief that our goal is to help others help themselves. I love the Constitutional foundation of this political ideology: that government is meant to promote the general welfare, not provide it. Marvin Olasky provides several excellent examples of compassionate conservatism at work. So why there stars? First, while I think supporting fsith-based organisations is a worthy goal, I feel he does not give enough credit to secu I like the theory of compassionate conservatism. It resonates deeply with my belief that our goal is to help others help themselves. I love the Constitutional foundation of this political ideology: that government is meant to promote the general welfare, not provide it. Marvin Olasky provides several excellent examples of compassionate conservatism at work. So why there stars? First, while I think supporting fsith-based organisations is a worthy goal, I feel he does not give enough credit to secular community-based organisations. Second, I found his chapter tearing down progressive liberalism quite off-putting. He said his goal was to compare our best to theirs, but I didn't see that happening. Although this book is rather pedantic which I think is surprising for a journalistic professor, I rather like the ideas that Olasky puts forth. Personally, I always equated social work and welfare as the rightful purview of religion (now that is probably because in the Philippines it is the Catholic religion that tends to the poor and disenfranchised). But, I can see the compassionate conservatism point of view and that is people need a spiritual/emotional dimension when they are in need such as Although this book is rather pedantic which I think is surprising for a journalistic professor, I rather like the ideas that Olasky puts forth. Personally, I always equated social work and welfare as the rightful purview of religion (now that is probably because in the Philippines it is the Catholic religion that tends to the poor and disenfranchised). But, I can see the compassionate conservatism point of view and that is people need a spiritual/emotional dimension when they are in need such as being poor. One can't expect a person to change their behavior by just giving them food and shelter because it does not engage their whole being. I also think if I were in trouble, I would rather have a religious person help me out rather than a social worker because I would imagine the religious figure would see me as a person instead of the latter focusing on me as a "case." Also, I like the bottom-up approach of social work in that social work should be about the communities and the people they are serving not some theoretical framework of how thinks should work. What I particularly like about Compassionate Conservatism is that it places the community and all its stake holders at the heart of its welfare instead of the government. I think this role makes sense because in the end it is individual people who are going to change lives not institutions. I really think government's role in helping others should be a catalyst for people to help each other. The problem with the liberals point of view in government helping other people is people are not engaged in the process so they think it is not their responsibility to be good stewards of their community. When in fact, the best stewards of ones community should be the people who are living in it not the government. I think this is the main issue on the tradition liberal and conservative viewpoints. Because liberals want to help but with government which in the end allows the general public to not care and conservatives think personal responsibility is all what it takes to succeed and thus they do not want to help others who are not fortunate. I also like the idea of the role of government in this case which is as a catalyst to these faith-based initiatives. The book provides that people should be allowed tax-credits for faith-based initiatives. Where I differ from Olasky is that I do not think it should be mandated but I do think their should be a provision in the law that people should be able to choose how their money would support others so instead of the government support of governmental social work, people can choose to give it to faith-based causes instead. Also, the government most importantly can help by having these groups cut out the bureaucratic red tape that so often slows down initiatives. And I also think it is probably okay to give grants to programs that work on the local level. As long as it does not favor one religion over the other. I like the fact that governments primary role in all this is poverty fighting tax-credits and for people who do not avail of this opportunity to give back, then federal funded social service vouchers can be given to those in need. Olasky makes the case that the 1st amendment says nothing about the separation of church and state which is true nothing is explicitly says that there is to be this separation but it does say that the state cannot establish a religion. The problem with the proponents of blending of church and state is that the biggest push comes from Christians because they want America to be a Christian nation, which the Constitution clearly states is not possible. Although I do think the whole school prayer in the battle ground is blown way out of proportion (because I do think school prayer is generally a good thing), I do understand the opposition to it because it would mean the establishing of Christianity as the de facto religion. This is a great vision for government but I do not know if this was actually executed by George Bush. In the original vision for Compassionate Conservatism, the notion is totally pluralistic in that all religions can equally compete for money. But perhaps, it did not really take hold because Bush is too closely tied to the Evangelical movement so Faith-based initiative was seen as coded to mean Evangelical Christian-based initiative. Since Bush's war overshadowed his administration, I do not know whether or not he actually enacted many of the compassionate conservative ideals that Olasky presented in his book. Read this little book in high school, to figure out what was "under the hood" with respect to the candidacy of George W. Bush. The book was mostly a collection of anecdotes on public-private partnerships, the role of faith-based community initiatives, and how these things fit as part of some kinder, gentler American conservatism that almost sounds Burkean at times. This is a very, very, very bad book. It's written badly. It's researched badly. 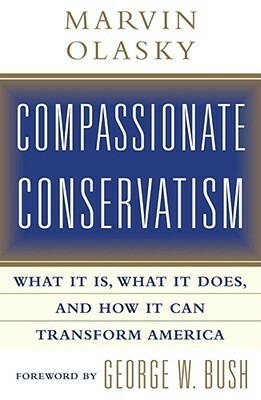 The author uses it to launch the claim that he came up with the term "compassionate conservatism." Take it, it's yours. He actually calls himself the "godfather" of compassionate conservatism, which ought to tell you how compassionate his conservatism is.